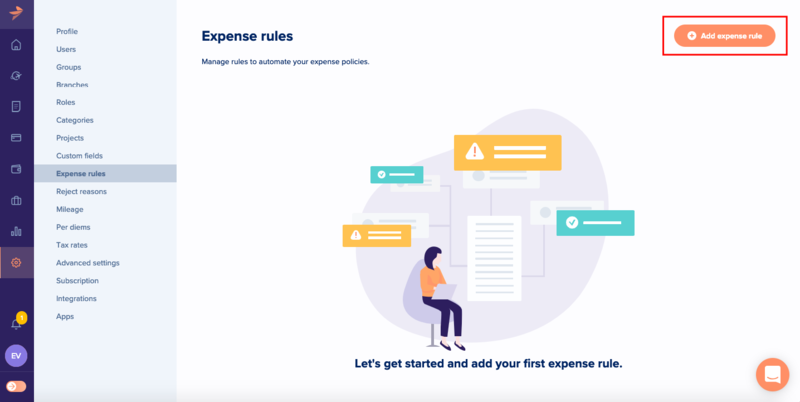 To help companies automate their expense policy, we launched the new expense rules. 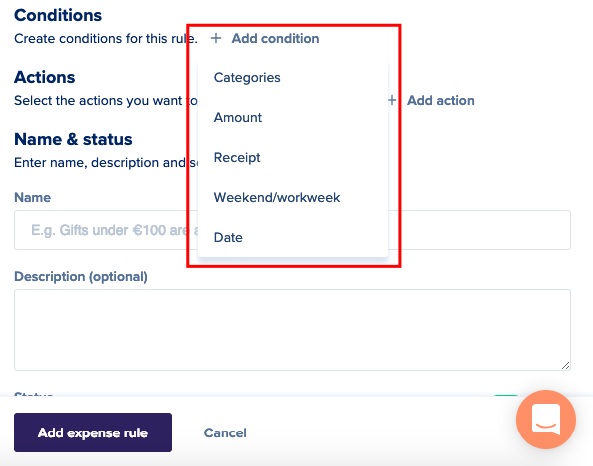 You can setup rules to automate approval or controlling of expenses within company policy or flag expenses that violate your policy. Below you can find a detailed article about the different options you have when creating an expense rule. If you prefer watching a video tutorial, you can click ▶️. To access the rules, go to Admin settings > Expense rules. You can add a rule by clicking on the button in the top right corner. 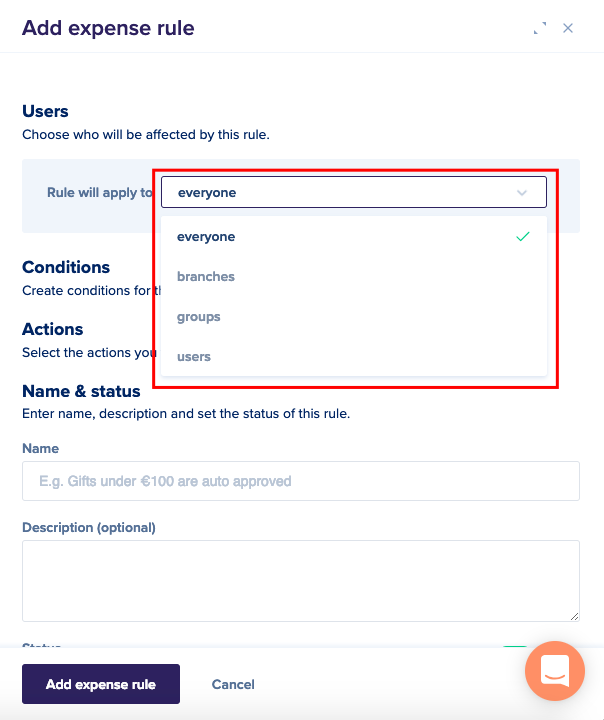 The first setting is to which users this rule should apply, you can filter on branches, groups and users, or you can leave the dropdown at 'everyone' so the rule will apply for the entire company. The next step in the setup is the conditions that have to be met to trigger the rule. 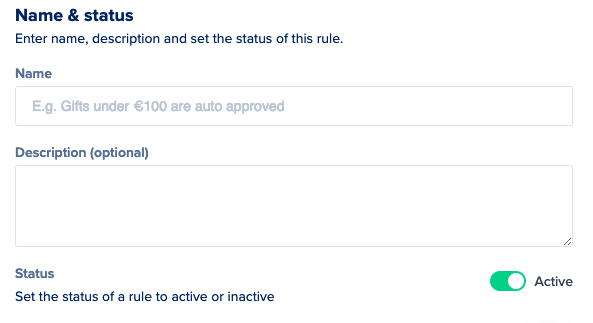 The first option is categories: here you can select the categories to which the rule should apply. We show the categories per branch, so you can easily see for which branch you have selected the category. The next condition is the amount, you can select 'more than, less than or equal to'. You can enter one amount in one of the currencies you have enabled in the account. If you have caps based on the country where the expense was incurred, you can add as many countries as you like with the 'add country' button. Here you can add countries, amounts and currencies as a limit. Note: the country field must be enabled on expense level to be able to identify in which country a certain expense was made. 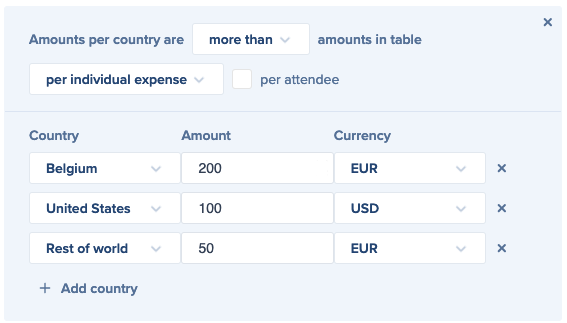 You can also enable the 'per attendee' checkbox, so if a meal expense has 3 people @mentioned in it, we calculate the amount per attendee. 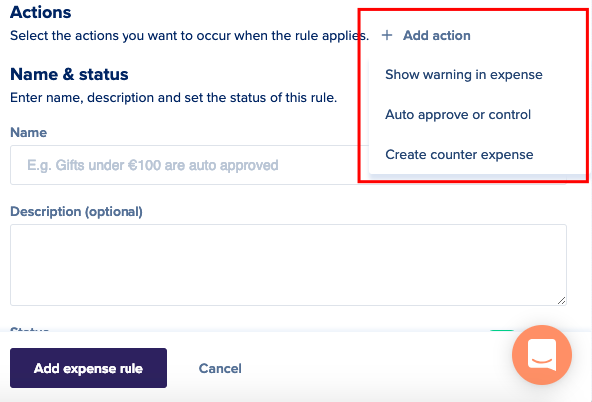 When the conditions are completed, you can enter what actions should happen when the rule is triggered. Show warning in expense: the user/approver/controller/finance will see that the expense is marked and a warning message will be shown to explain what rule has been triggered. For the user, the warning will shown with a ⚠️ icon and the warning message displayed in a yellow banner. 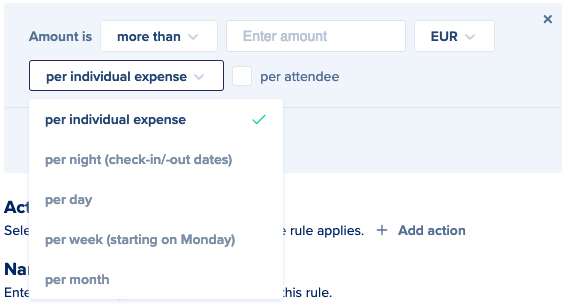 Auto approve and/or control: you can select if the expenses should be auto approved, auto controlled or both. Create counter expense with excess amount: you can automatically create a counter negative expense for expenses that are above budget. Create counter expense with fixed amount: you can deduct a fixed amount from all expenses triggered by this rule (for meal voucher deductions for example). The deduction will only happen once a day (based on the date the expense was made). Lastly, you can give a name, description and status to the rule. If you are not ready with the setup of the rule, and you want to keep the progress you already made, you can save the rule as 'inactive', so you can finish the setup later on.